Shares of J.C. Penney fell Friday after the ailing retailer said it would raise cash through a public offering of 84 million shares. The retailer priced the offering at $9.65 per share, which was below Thursday's closing price of $10.42. The offering could raise about $810 million. J.C. Penney (JCP) shares dropped about 8% after the opening bell, trading at around the $9 offering price in the morning. The company said it plans to use proceeds from the offering "for general corporate purposes." Underwriters will have the option to purchase an additional 12.6 million shares in the next 30 days. Goldman Sachs (GS) is managing the deal, which is expected to close on Oct. 1. It's been a rough year for J.C. Penney. The company has been hemorrhaging money, losing $586 million in the second quarter alone. 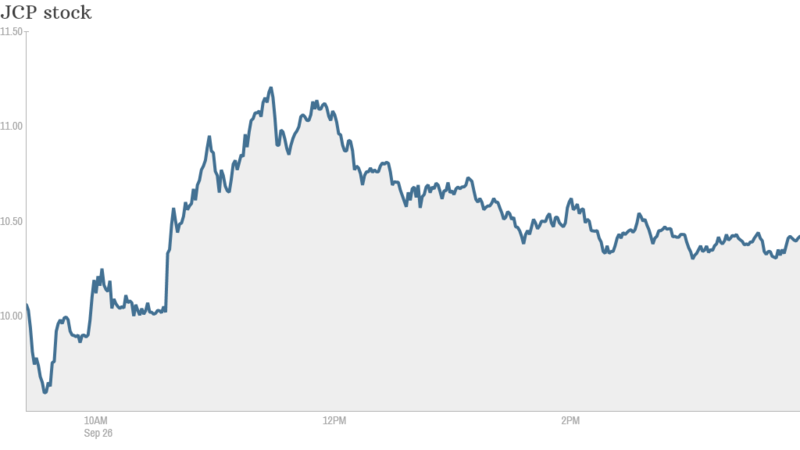 The stock is down 47% in 2013. Activist investor Bill Ackman added fuel to the fire when he cut his losses last month. His hedge fund, Pershing Square Capital Management, sold its entire 18% stake in the company. Ackman had tried to save the company by recruiting Ron Johnson, former head of Apple (AAPL) retailing, to lead J.C. Penney as chief executive. But Johnson got rid of company discounts, distancing its customer base and sinking sales. So the company him pushed out earlier this year. The company is now being led by interim CEO Mike Ullman, the former CEO of the company.